This two-week football training for the youth and for football coaches will happen in a span of 12 days from April 19 to May 2 in Metro Manila and in Negros Occidental. Goooal! participants will be trained by the best coaches from the Real Madrid C.F. youth team in Spain on individual technique and tactical team training. It all started with a novel joint project in Nasugbu, Batangas designed to keep children in school and out of harms-way through the practice of football. Notably, the proceeds from “Goooal! : The Real Madrid Foundation Clinic” will go to Fundación Santiago’s Volun2rism Program, particularly the Real Madrid Foundation Social Sports School (Escuelas Socio Deportivas) in Batangas and Negros Occidental. It will foster inclusive development for under-served children while they pursue their passion for football and enhance their academic performance. The Social Sports School likewise aspires to teach them good values associated with sports and teamwork as well as healthy living. 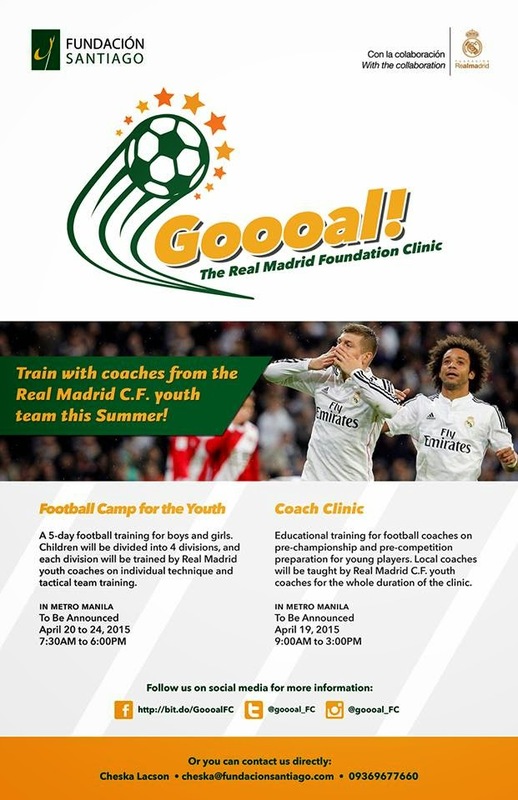 This summer “Goooal: The Real Madrid Foundation Clinic” will hone the football skills of participants, ages 7 to 18 years old, in daily sessions held at the Rizal Memorial Stadium in Manila from April 20 to 24 and at the SJR Football Field in San Carlos City, Negros Occidental from April 27 to May 1. The Coach Clinic is a whole day educational session for football coaches on pre-championship and pre-competition preparation for young players, set for April 19, in Metro Manila and on May 2, in San Carlos City, Negros Occidental. “Goooal: The Real Madrid Foundation Clinic” is supported by the Philippine Sports Commission, the Spanish Embassy in Manila, MAPFRE-Insular, Roxas Holdings and Lifeline.